Sometime around the 15th of February, someone had forwarded to H2H a paper called Einstein Revisited by one Mr. Balwant Bhaneja. We were looking through the references of this paper and found that it contained a reference to an article in Sanathana Sarathi! We became curious and searched for this article and found it in the 1992 issue of Sanathana Sarathi. This was a two part article by Mark R Abrams, whose father was the personal physician of Einstein! We were wondering why Swami sent this article to us at this point of time and upon further enquiries found out that the birthday of this great scientist was on March 14th! Strange are the ways of the Lord! This is the first of the two part article, the second of which will appear in the next issue. We hope you enjoy reading it…..
Albert Einstein was my Godfather and a family friend. Over the years I have sought to increase my understanding of this great man, and the spiritual implications of his work. Einstein was a scientific giant who, perceiving the unified nature of reality, was able to express some of it mathematically. 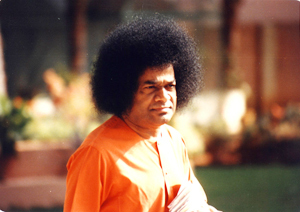 Beyond the role of scientist, he can best be thought of as a spiritual giant whose life, in terms of humility, compassion for humanity, and one pointed focus on God, stands as an example of how Sathya Sai Baba teaches us to live most happily. Albert Einstein stands as a precursor and example of the unique type of scientist so sorely needed in the world today, the type that Bhagavan is currently graduating from His Institute of Higher Learning. Under Swami's loving hand, these are "whole" scientists. Their aim is to benefit society and not merely accomplish selfish ends without thought to their work's impact upon humanity and the environment. These are scientists who combine spiritual awareness with state of the art training. Swami's graduates are at the leading edge of discovery in various fields. Three recent Ph.D.'s in physics had the unheard of experience of having their papers published in American physics journals within a year of receiving their degrees! Grounded in the truth that God is the source of all phenomena and knowledge, they maintain the perspective that the best path to understanding creation is to study the Creator. Einstein also was this type of scientist, and his life was guided by this principle. His overriding goal was to "Understand how the 'Old One' thinks." And he devoted his life to the effort to gain "knowledge of the ultimate immu¬table essence that underlies the mutable, illusory world." In the first part of this article I will mention some personal stories about my family, Baba and Einstein. The second part will include some of Einstein's thoughts on science, spirituality, education and character, as well as what Swami had to say about him during a recent interview. Although Einstein was deeply saddened by the ironic fact that some of his work led to the development of nuclear weapons, we might also consider that the work also holds within it a scientific illustration of the spiritual truth. This article will conclude with some musings on how some of Einstein's work may be useful as one more 'tool' to help free us from Maya and accept the unseen Atma as the fundamental truth of life. My father, Dr. Henry Abrams, opened his general medical practice in Princeton, New Jersey, in 1938. A year later, the physician who had been caring for Prof. Einstein, his daughter Margot and secretary Miss Helen Dukas, was leaving for further training. He approached my father and asked if he would care to take over, and he readily agreed. 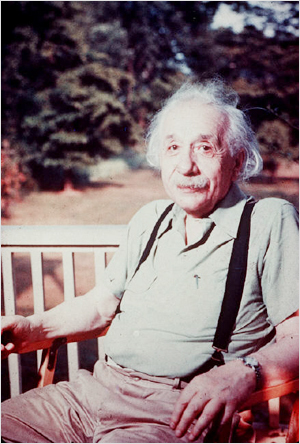 He cared for Einstein and the others until the out¬break of World War II. During the war my father was stationed on the cold and desolate island of Greenland. He and Einstein corres¬ponded. While in Greenland my father received a letter from Einstein remarking that this should be a "contemplative period" for him, and urging him to consider getting further medical training in some speciality. Subsequently, my father did that, and returned to Princeton as the town's sole ophthalmologist. When I was born in 1949, he asked the profes¬sor, as Einstein preferred to be called, if he would be my Godfather, and Einstein consented. Thus, following Jewish tradition, Einstein was the one who held me for the eris Milah, the ritual circumcision ceremony. He was to have a minor contact, but a major impact over my life in the years to come. Further, because in the West the Godfather is considered a child's spiritual teacher, I have come to consider Professor Einstein to be the first of several spiritual teachers in this life. They ultimately led me to Bhagavan. Einstein died when I was six, and my recollections of him are few. I do remember that he had a very nice laugh, which he used often. For my fourth birthday, my parents and I were invited for a small celebration. My uncle took the opportunity to photograph the Professor and me dealing with the gifts that his secretary had obtained: a toy log cabin and a bag of foil covered chocolates in the form of "gold coins." It was this latter which occupied most of my attention. Professor Einstein worked on the log cabin, trying to fit the simple pieces of wood together. Interestingly, when I grew up and printed all the negatives, there was a picture of my mother leaning over Professor Einstein and the logs, showing him how the ends joined. Of course at that young age I had no idea of what was so special about being around this nice old man. It wasn't until I was at college that I really began to appreciate the honour of being his Godson and to consider what his scientific work meant. I discovered meditation at the age of twenty. As my spiritual journey proceeded I became intensely curious as to what my link was with such a luminous soul. Baba found me at twenty three. As you can imagine, I regarded my first trip to the Avatar as a possible opportunity, among other things, to learn more about my relationship with Einstein. It may come as no surprise that throughout these and subsequent trips, Leelas have been the order of the day. Baba, the consummate "tour guide", treated my wife Marsha and me to a host of travel experiences over the course of my first visit to India. We had no desire to be anywhere but where He was, and since He went to Delhi, Madras and Hyderabad we were overjoyed to be allowed to follow Him. In Hyderabad a most interesting incident occurred during a discourse Swami was giving in a large auditorium. It was very hot and I had just eaten lunch. As time went on, I realized to my horror that I was being overtaken by a powerful drowsiness. As 1 was sinking into thamas, I projected a thought to the Lord: "Baba, the only thing that could keep me from falling asleep right now is if You were to mention Einstein...” I knew He could do it but didn't really expect it at all and continued my descent. Within sixty seconds, my head thrust backward as Swami's lilting pronunciation of the name "Einstein” entered my consciousness from His ongoing flow of Telugu. I was awake then, and became riveted to the story He recounted of how a young Indian physicist during an appointment with Einstein eagerly probed for the ultimate in Western scientific wisdom. What he received from Einstein however, was, to roughly quote Swami, "Every major conclusion I’ve arrived at is contained in your Bhagavad Gita. Look there!" My curiosity about the connection was inflamed anew! I was dying to get some insight into "why me?" As Swami's translator for the discourse was himself a nuclear physicist, I approached him afterwards hoping for some kernel of insight. He had nothing personally to share, and as far as learning more from Sai he said, "I counsel patience..." I was disappointed but left knowing I had received sound advice. Approximately one month later we found ourselves in the interview room at Prashanti Nilayam. I was sitting on the floor just to Swami's right as He was talking to various people in the group. Seeing His footstool off to the side and recalling how frequently He is seen using one, I took the opportunity to perform the logical but minor Seva of placing it in position. He accepted and I felt happy. After some time there was a lull in the give and take of conversation. No one was asking questions and Swami was silent, save for the quiet phrase "And you sir?" drawing the words out slowly. The thought came that He seemed to be addressing me. I was at a complete loss for words. I was embarrassed to be addressed personally in front of the group. I definitely had something I wanted to ask and whether I was being addressed or not, it was an absolutely clear, appropriate chance to approach Baba about it. Perhaps as many as two or even three solid minutes passed. An ego based lack of confidence prevented me from simply asking, "What is my connection to Einstein, Baba?" I feel Baba gave me many chances there, but finally a new dialogue began with someone else. The moment was lost and I clearly could not cut in. I was to wonder many times after that if the opportunity might not have been lost forever. That was in 1978. More blessed interviews occurred in ensuing years and questions about more important matters were raised than about my Godfather. It was okay; I had become patient and accepted that He would reveal whatever I needed to know in its own best time. After Professor Einstein's death in 1955, Miss Einstein and Miss Dukes remained patients of my father and friends of the family, remembering birthdays and attending my Bar Mitzvah at 13. My mother sometimes gave them rides around town as they did not drive. For sometime I had had a yearning to visit Einstein's home to see his study. In 1983 my sister planned to get married in Princeton and this looked like a good opportunity. My father called Miss Einstein to arrange a visit and on a cold December day he, my stepmother and I spent about two hours chatting with this completely unassuming artist in the parlour of the house where she had lived for close to fifty years. She told us of her time spent studying art at a convent in Italy and showed us a beautiful little wax sculpture of Saint Francis, for whom she had a special affection. Somewhat paralleling that 1978 interview with Swami, I had been feeling some reserve during this conversation about requesting to see the Professor's study. This woman was elderly and appeared frail and I didn't want to trouble her by an extra trip upstairs. Clearly it was getting time to go. I had to act quickly or the chance would be lost. Thinking of Swami I made my request and she responded with an enthusiastic "Sure!!" and charged up the stairs to the room in question. On the way we passed her father's bedroom which was very plainly furnished, like a monastic cell. Then we were in the study. Bookshelves lined the walls, and a wide window faced a deep garden in the back of the house. To the left of this picture-window were two portraits, one of a bearded Jewish sage, the other of Mahatma Gandhi. One shelf contained all of the original issues of "Der Annalen der Physik" (Annual of Physics), the journal in which both Theories of Relativity were first published. Then, just as I noticed a large easy chair and footstool, Miss Einstein "commanded" me to sit in it. How could I refuse? I smiled broadly to myself, remembering Swami's footstool and feeling His subtle presence in what for me was a meaning¬ful coincidence. We took pictures, looked around a bit more and left. Later, I remembered Swami had said Einstein had a copy of the Bhagavad Gita and wished I'd looked for it. As we left, my father recalled the time, years before, when he'd brought his brother in law Elliott Montroll over for what Einstein's formidable secretary had said would only be a three minute appointment. My uncle, who was to be later named to the Einstein Chair of Physics at the University of Rochester, would have been overjoyed just to have shaken hands, but Einstein offered them lunch. They declined. My uncle ended up spending half an hour at Einstein's dining room table, talking and laughing with him about physics, while my father beamed with joy, understanding not one word. My father, only on being asked recently, recounted to me how every three or four months for some years he would receive a call from Einstein's sec¬retary asking him if he might be able to spare a few minutes, as the Professor wished to talk. Somehow, especially in the early years of his practice, he always found time to go over, for discussions involving the non scientific topics his host was interested in, such as philosophy, and world and national events. Always straightforward and humble in human dealings, Einstein came to accept and use the bewildering fame that was thrust upon him in the only way that made sense to him—service to humanity. He worked tirelessly throughout his life promoting peace, freedom, and respect for all people. Dad recalled how Einstein's efforts during the 1930's and World War II enabled a certain number of Jews to escape Nazi persecution. The Professor also spent many years working for the United Jewish Appeal in establishing the state of Israel and accepted my father's invitation to co chair the local fundraising campaign with him in Princeton for several years. My father considers himself a rational scientific and appropriately skeptical man, who, while loving his religion and believing in God, puts great stock in what can be touched, seen, and measured. My wife Marsha returned from her first trip to Swami in 1977. She had been present at the last public Mahasivarathri, during which our beloved Swami manifested Vibhuti, showered the audience with Ram Tirth (holy water) , and produced what Professor Kasturi was later to describe as a "self illumining crystal Lingam" (emphasis mine). Soon after her return, Marsha and I were on a visit to my father and stepmother. When they asked her, "Tell us about your trip in India," she proceeded to do just that, with all the enthusiasm of one who had just returned from her first three months with the Avatar. Producing photographs of Swami holding up the glowing Lingam, Marsha excitedly explained to this senior medical man how Sai Baba produced this unidentifiable object in His body, and then brought it forth from His mouth every year to the delight of His devotees. This was, to say the least, very difficult for my father to grasp or accept. We did not know it at the time, but this conversation was a turning point in our relationship with our folks. Being so unfamiliar with anyone even remotely like Sai Baba they felt sure that we were being taken in by a master magician, and "feared for our sanity". As the years passed however, their fears abated when they perceived we had not given up personal control over our lives, and continued to develop as human beings. Three years after this visit we were back again, talking in that room where the fateful exchange had taken place. I was browsing in the kitchen cabinets when I spied a set of goblets I had never seen before—of clear heavy crystal. "Hey Nona!" I called to my stepmother with mild curiosity, "Where did you get the crystal goblets?" "Oh, those were a gift to your father from Dr. Sivalingam." "Oh." I replied. So, the sceptical doctor who so profoundly doubted Lord Siva's ability to produce a Lingam of crystal, had himself received crystal from a doctor named Sivalingam! And unknowingly participated in an exquisite first hand experi¬ence of what Einstein might have meant when he proclaimed, in referring to how "nature conceals her sublimity": "SUBTLE IS THE LORD..."
At the time I could not even comment, finally bringing it to their attention two or three years later.